Nonetheless, we walked next door and got all the Happy Hour treats I had seen just weeks earlier. 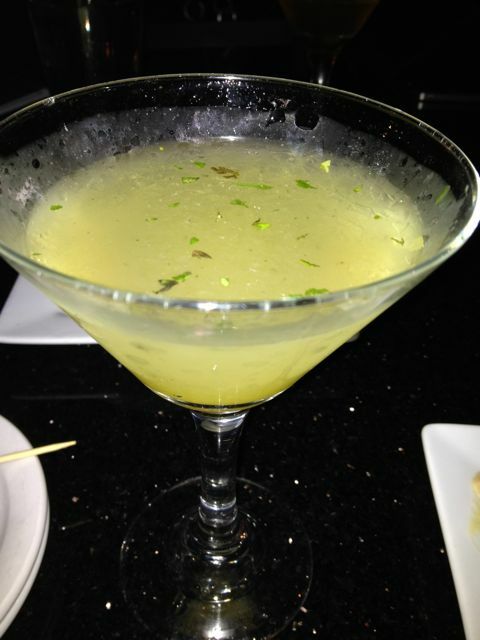 Best part is the martinis, which are already priced pretty good, are half off. Score! Plus, it’s their specialty. We pretty much ordered one of everything, or at least it felt that way, but here is just a sampling of what we did get.We got 2 of the flatbreads, which were large and only $4. 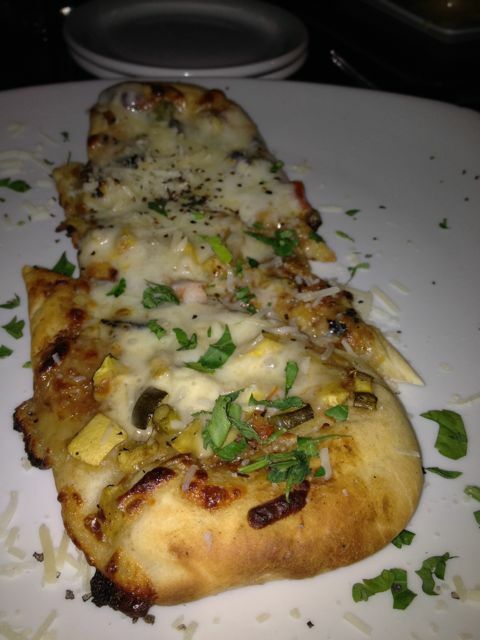 This one is the roasted veggie flatbread. We also go the Ahi Tuna Sliders, Pork Tacos, Grilled Goat Cheese Polenta Cakes, Crab Cakes and the Salt and Pepper Ahi Tuna. I won’t lie, I think there was more, but it makes me feel better to stop right here. 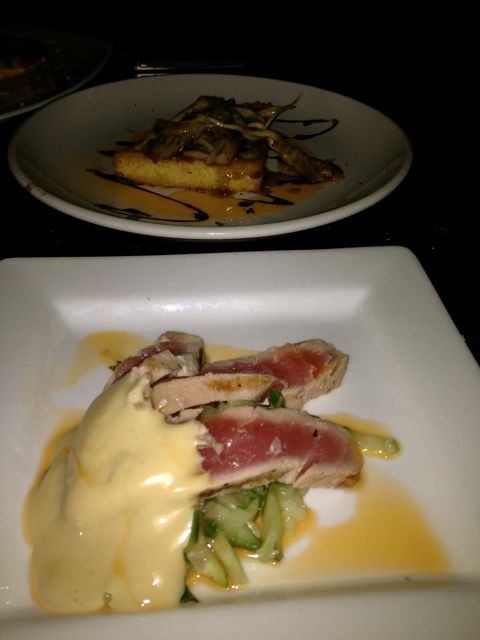 Everything we got was good, especially the salt and pepper Ahi tuna. The only thing I did not like was the crab cakes. I am pretty picky and these were way to breaded and not enough of the goodness inside and they were deep fried. But honestly, with all we ordered, that was pretty good to only not like one thing, right? Now to give all the attention to the drinks. I had the Basil Berry Martini. Herbs and fruit, who knew? I had tried a few others when I was there before, but liked this one the best. Before you judge me….I was sampling the drinks of my friends. I do have boundaries you know. They are very creative and have some great drinks. If you are out looking for a drink, stop by here. Atmosphere is pretty cool. It’s very dark with a cool bar. It wasn’t busy when we were there, so it was even fairly quiet, but not sure that is always the case. Pricing was really good especially the Happy Hour prices. Some of the best I have seen. In the end we ordered 4 drinks, at least 7 appetizers, although I think it was more, and with tip our total bill was $51. They do have wine and beer, but please note their specialty is their Martini’s. So order a Martini, any martini. Service was really good. She found out it was my birthday and brought me out a birthday treat, which was some super yummy fondue. Bartini located in the NW District off of 21st and Glissan.